And bring me home, dear little town, to thee." It says what we, in the southeast corner of Nebraska, see and feel when we stare at the landscape God has given us. Those who didn't grow up in this beautiful, rich farming landscape don't always understand why we stay and love the land and the seasons. I think Clayton Duff captured how we feel in our hearts about the changing seasons in southeast Nebraska. 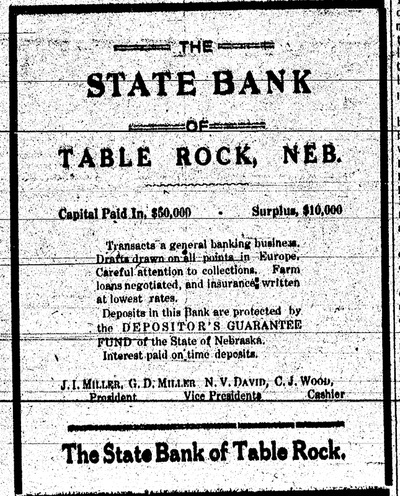 And he did it over 100 years ago! Photo 104: "The Jolly Four"
"The Jolly Four." Lloyd Andrews, John Fellers, Lowrain McCrea, and William Vondrasek. 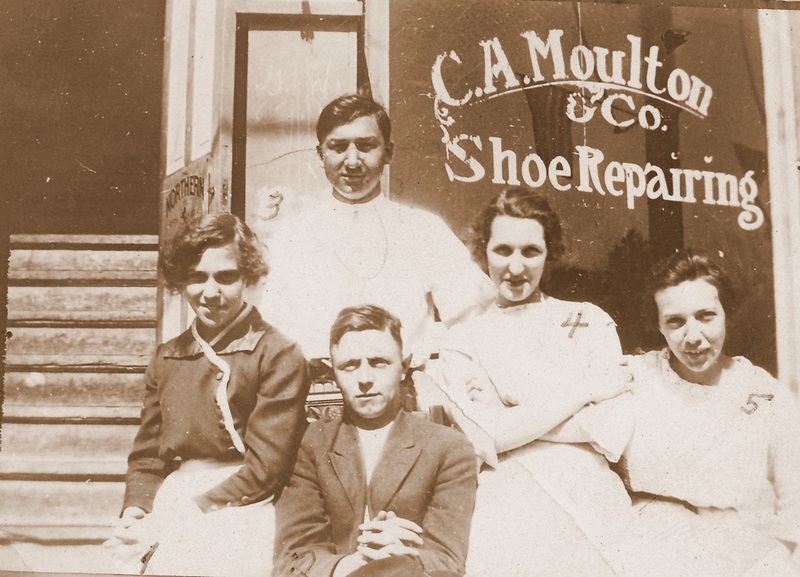 Photo 919 - In front of the shoe repair store. Edna looks a bit miffed, and Bill doesn't look very happy, either. Everyone else is having a fine time! 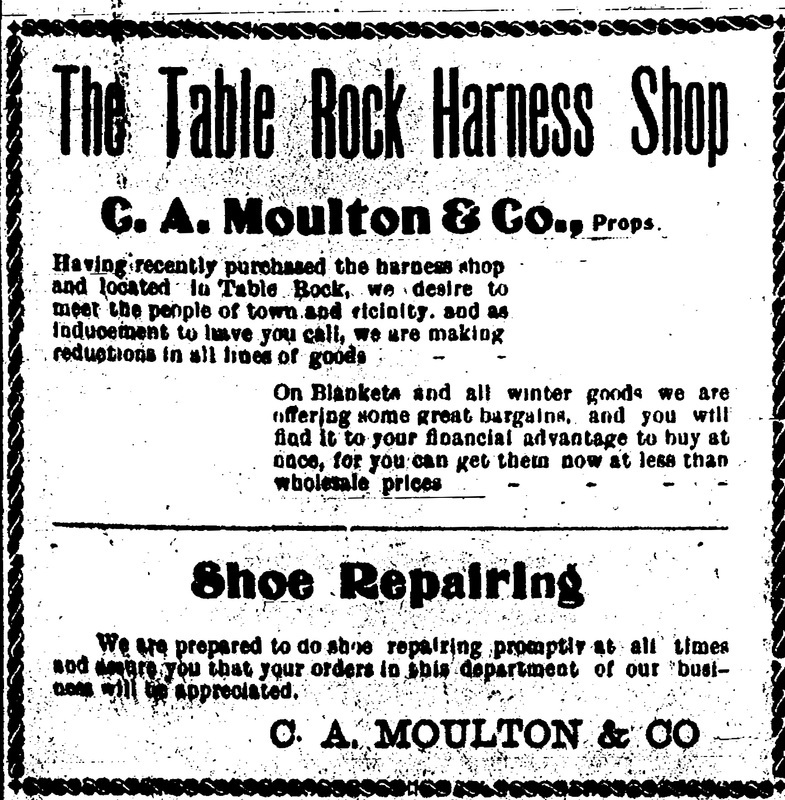 1909, C.A.Moulton had opened for business. 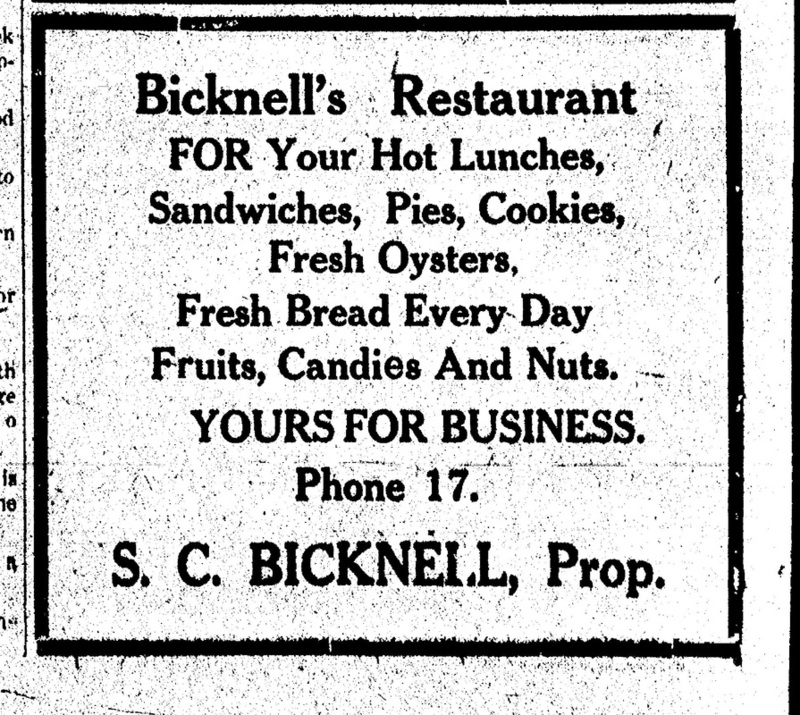 Charley Burrows celebrated the New Year with a a big, surprise, oyster supper, and "everybody responded to a good time." 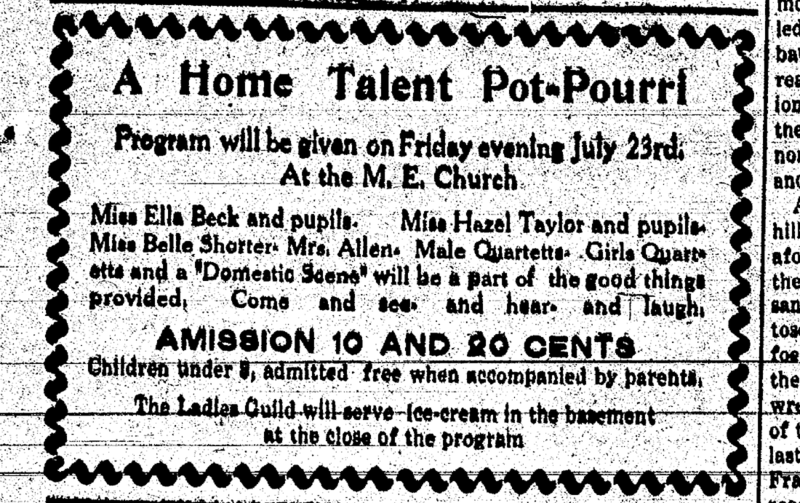 There was some darn good entertainment. 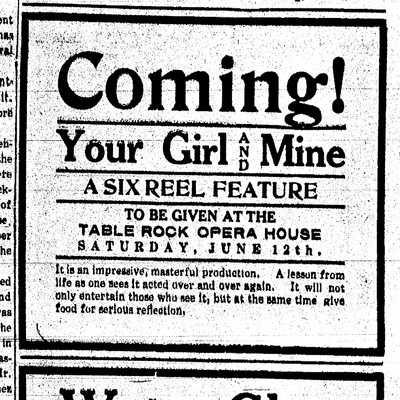 At the Opera House, you could buy tickets the Opera House Drugstore to see The Girl of Eagle Ranch, a fine "comedy drama." 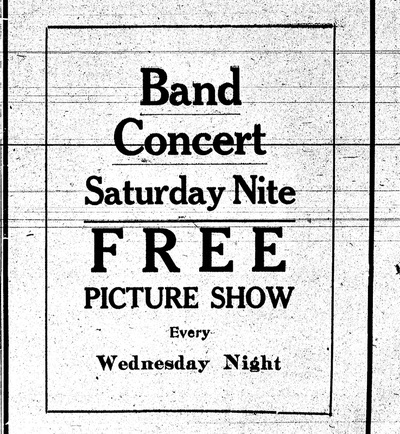 To publicize it, "A Real Cowboy Band" made "their novel andpicturesquare parade at 4 p.m."
Did the Table Rock audience agree? The result is lost to history. Photo 177. 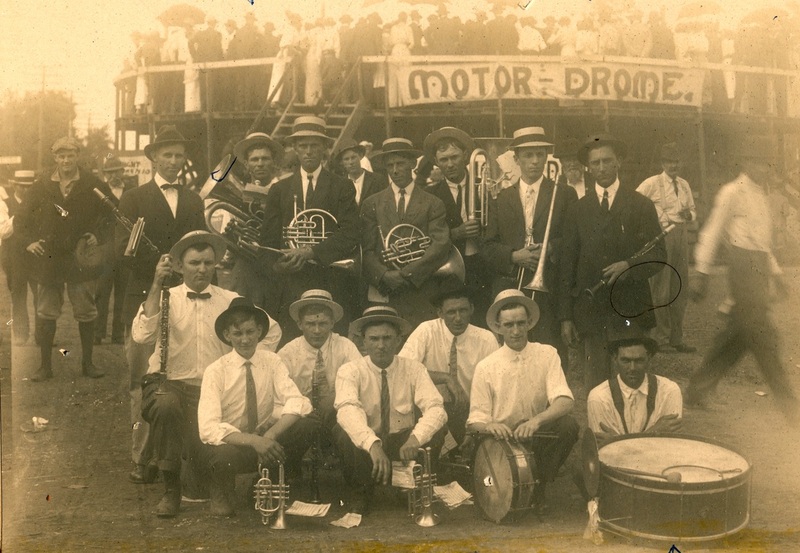 Another Bohemian band, about 1915. 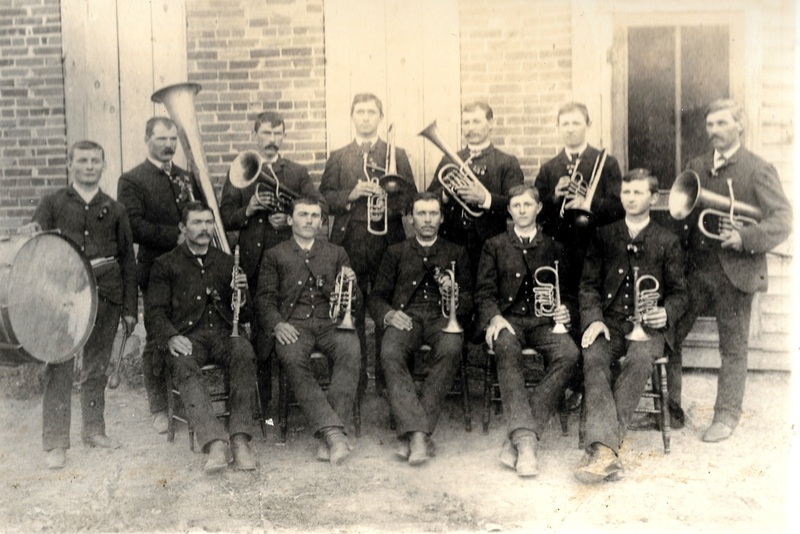 In front, in white shirts: Joe Tomek, Frank Tomek, Jess Vondrasek, Emil Rabstejnek, Arnold Petrasek, Earl Irwin, and, withy the drum, Chester Fisher. 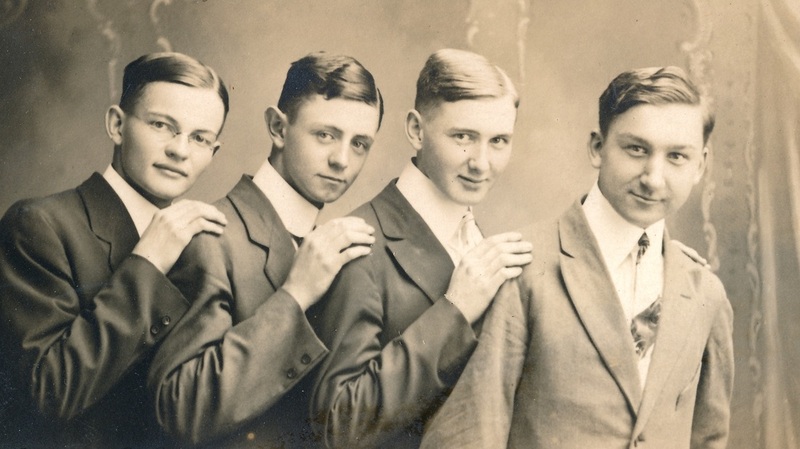 Back row: John or Fred Tomek, Tom Krofta, Art Krofta, Charles Rabstejnek, Ralph Cotton, Charles Klaine, Otto Vondrasek. According to Wikipedia, these motorcycling motor-dromes "were very dangerous and the danger was aggravated by the riders' lack of proper safety equipment. 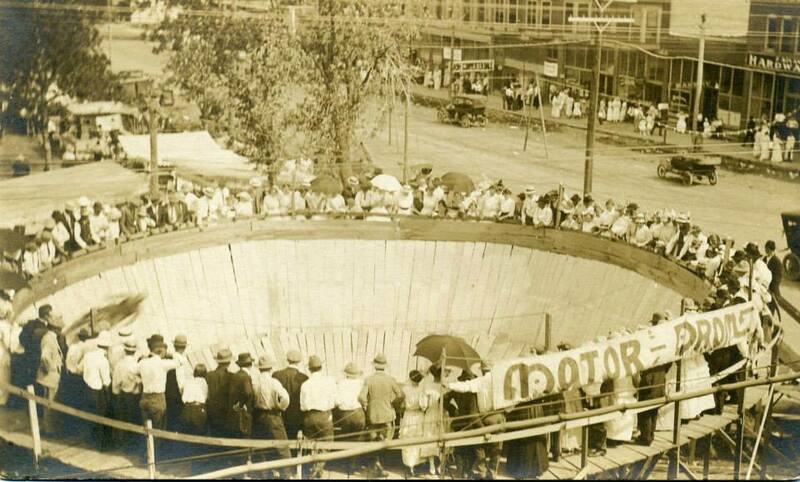 Fans sat above the top of the track, looking down at the racers. When a rider lost control, he could slip up off the track and into the crowd. Many fatalities occurred, often involving spectators"..."Board tracks proliferated in part because they were inexpensive to construct, but they lacked durability and required a great deal of maintenance to remain usable. 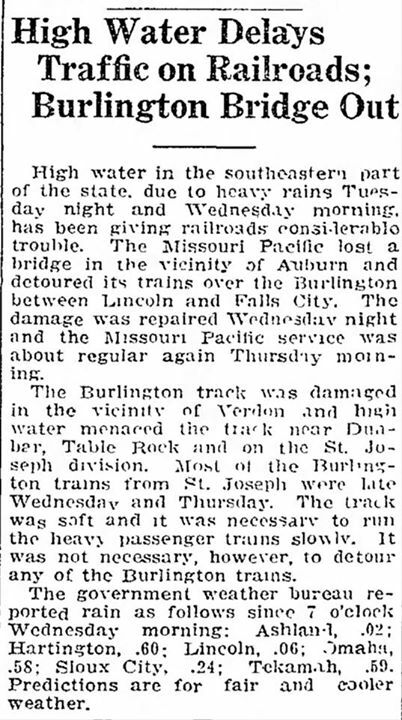 Many of the tracks survived for as little as three years before being abandoned." 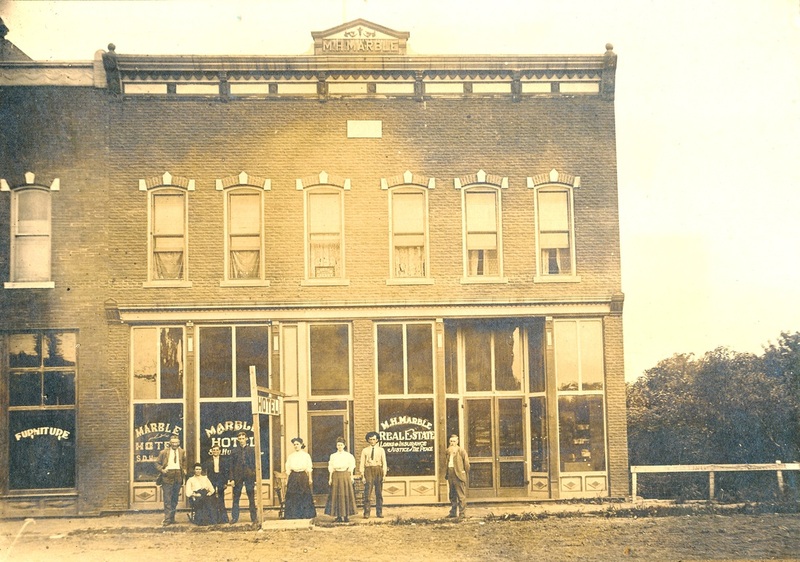 Here is the City Hall that was being finished. 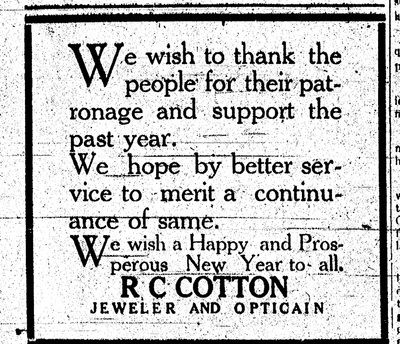 It's 100 years old this year! 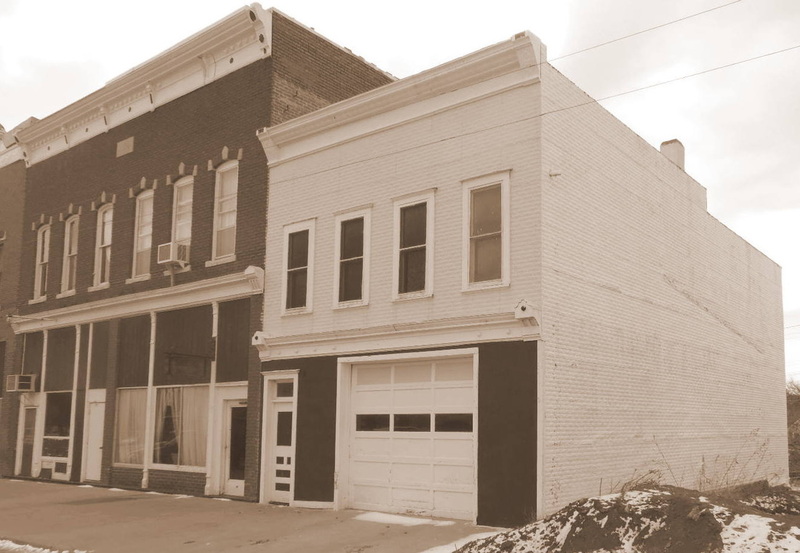 These were taken in February 25 and retouched to sepia for fun. 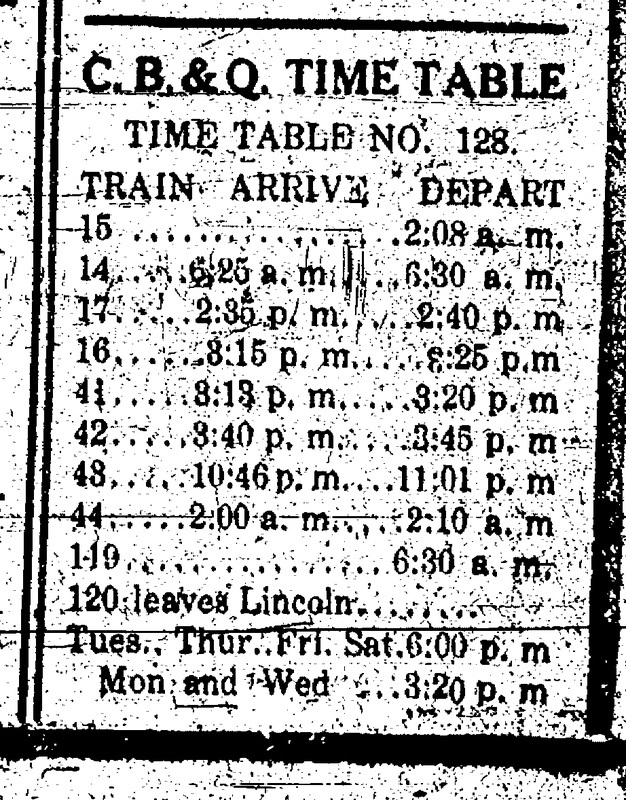 And speaking of M. H. Marble, who was a Justice of the Peace, on June 18, George Miller had to go before him because of a speeding ticket....which was given to him a year after the fact! Miller said he wouldn't have minded it so much, but the event had been so long ago that he didn't get to have fun of remembering the "joy ride" for which he was given the tickete. 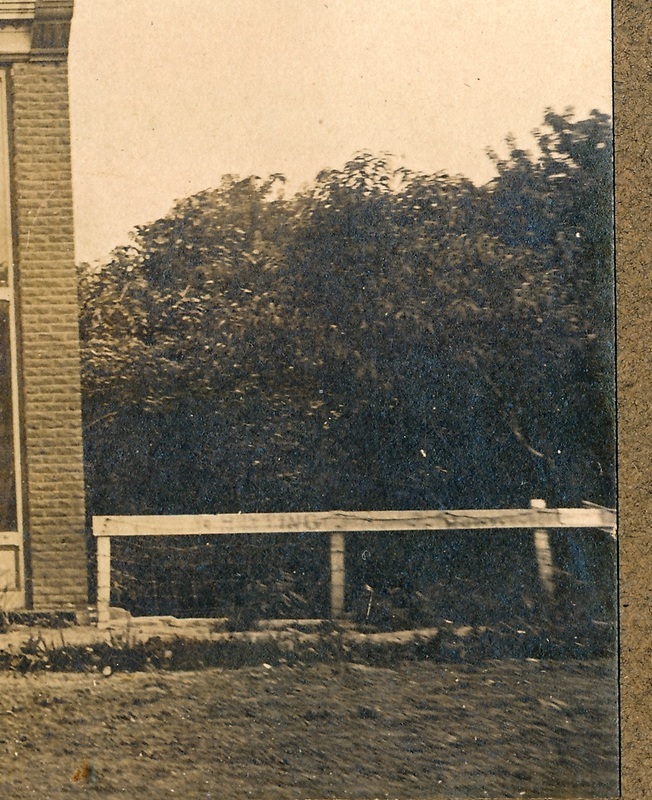 What WAS the speed limit in 1915? 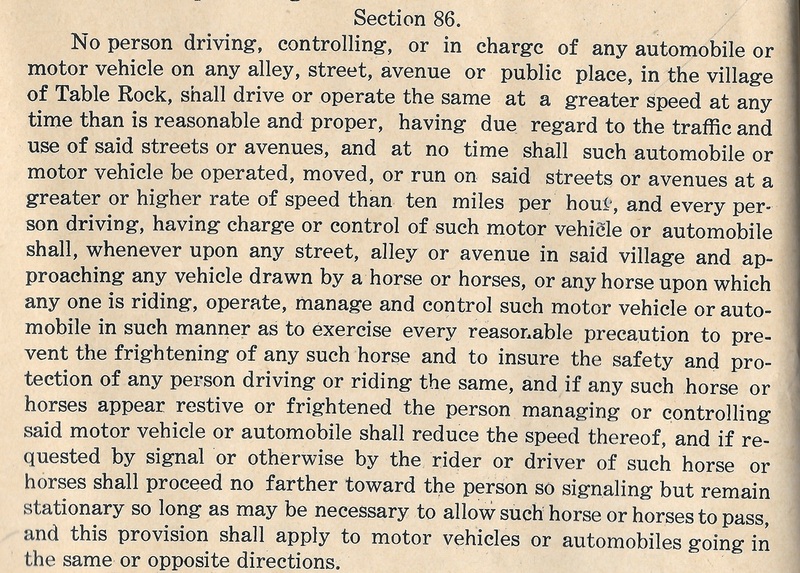 10 miles an hour according to the Ordinance 74, Section 86 (1911) that seems to have remained in effect. Read it for yourself, below, along with the rules about accommodating horses if you were on the road. The fine was $10 to $50, according to Ordinance 74, Section 87.
how do you know how fast you're going? 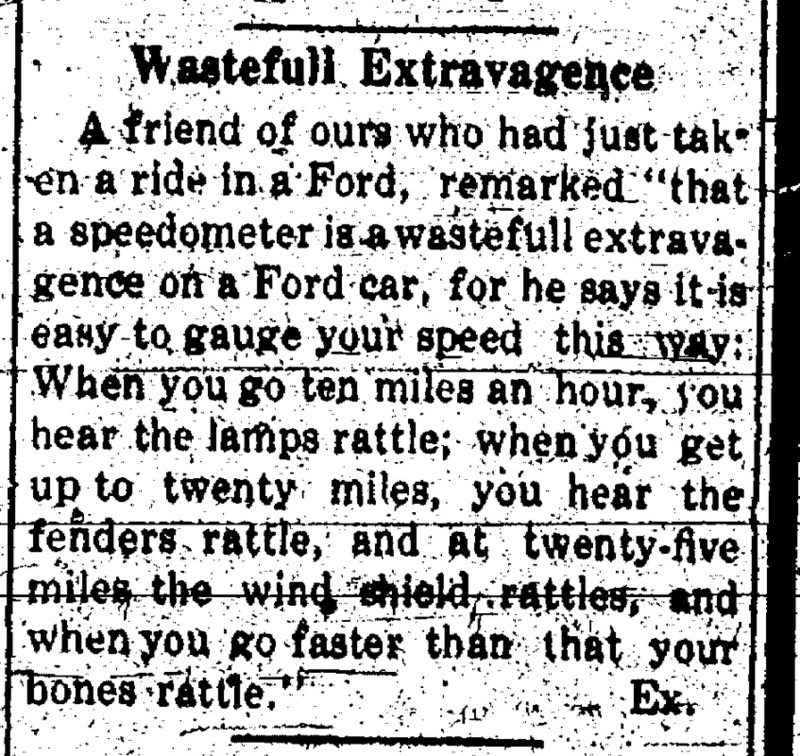 November 5, 1915: If you're driving a Ford, you don't need a speedometer. It's a wasteful extravagance. There are other ways to tell your speed, according to this article in the Argus. 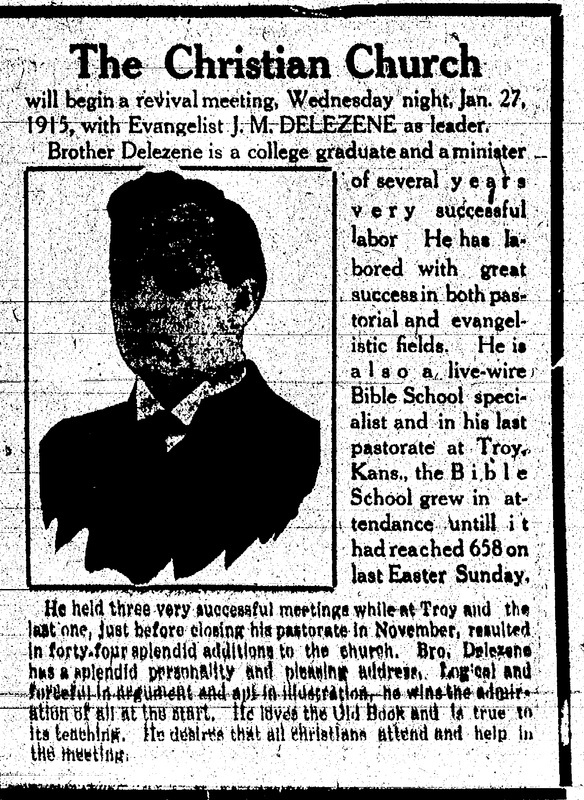 Again going off the topic of 1915, but following the connection by the article above, Dr. McCrea should be mentioned. He delivered over 300 babies here in his time so is worth remembering. 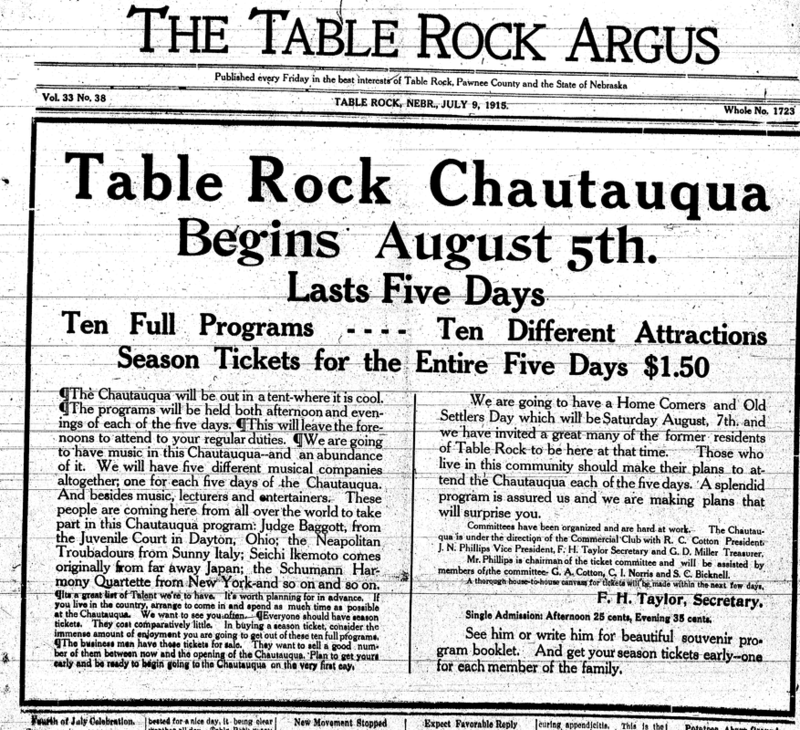 In his autobiography, Dr. Ed McCrea, wrote that he was the first person in Table Rock to buy a "horseless buggy." He bought it in St. Louis and had it shipped by express. “When the boys had it to unload from the express cart, it was a task. 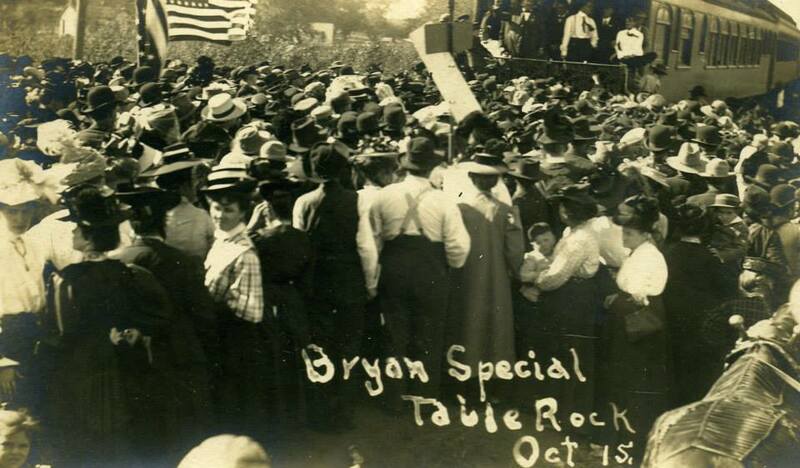 Everybody and dad was called to lift the machine and get it on the platform.” The next day they loaded it on a dray cart to take to Upper Town and Table Rock turned out to see it. It had high wheels driven by chain, and a six-horse marine engine with “one lung” (cylinder). He got a mechanic from Humboldt to take the first drive. He was unhappy with it in the end. It ran on dry ground but wouldn’t pull its own weight up a hill. He sent for another. He didn't mention the make of the car but it probably was not a Ford. Dr. McCrea said he hated Fords. “A man has H____ enough on earth without driving a Ford,” he wrote. He had bought a Ford, even though a mechanic told him not to, because it could not go anywhere when the mud was deep. The mechanic was right. Then a wheel came off when he was going 60 miles an hour, the wheel “jumping like a jack rabbit” as it hit bumps on its merry way. He got rid of that Ford and never bought another. Dr. McCrea did not say WHEN he was writing about. The first horseless buggy was probably a number of years before 1915. Fords were produced in 1908, but he had other cars in between the first and the Ford. One item in the news was the death of a cook off a Burlington train. 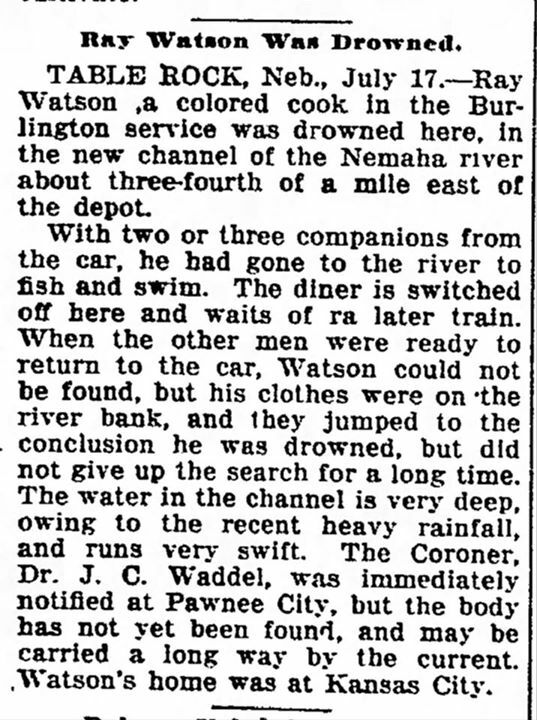 On a hot summer day he friends had taken advantage of a layover to take a swim in the Nemaha. When they got ready to return, he could not be found and was presumed drowned. The news later reported the finding of his body. Foul play was at first suspected, but (as reported in a third article that has been misplaced) the coroner eventually ruled the death as accidental. 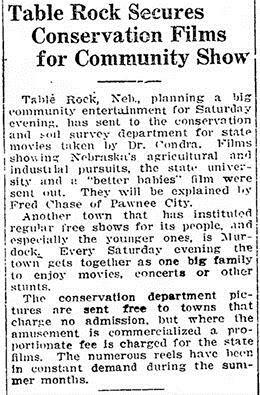 January 1915, corn growing contest announced. 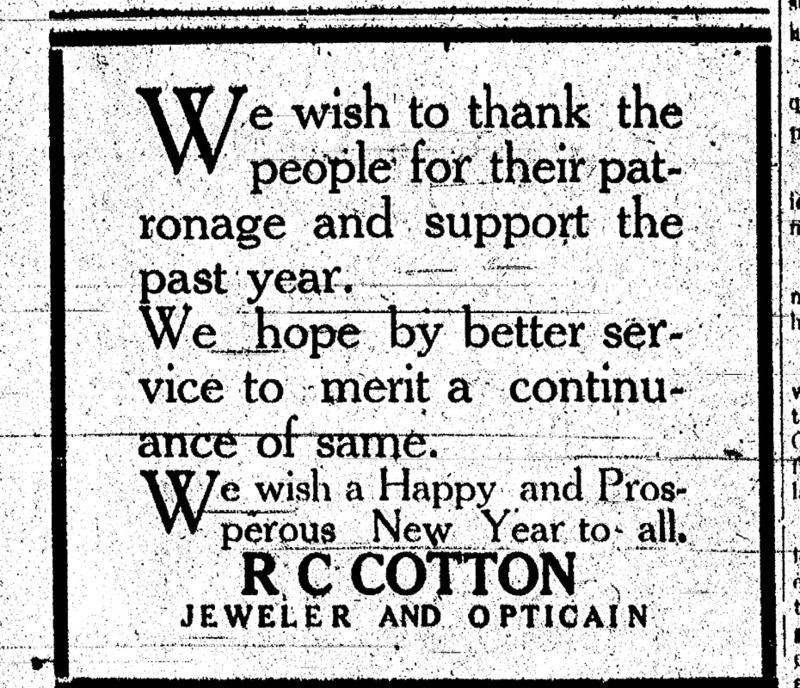 June 1915 crop information. 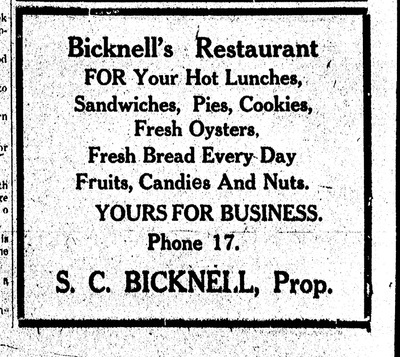 Family names mentioned: Purcell, Bicknell, and Wood. Bill Frank was in the news in this 1915 social clip, having had a "hurry up" call to take care of a very sick horse. Here he is with his stud horse Viola Roberts, Photo 201 below. 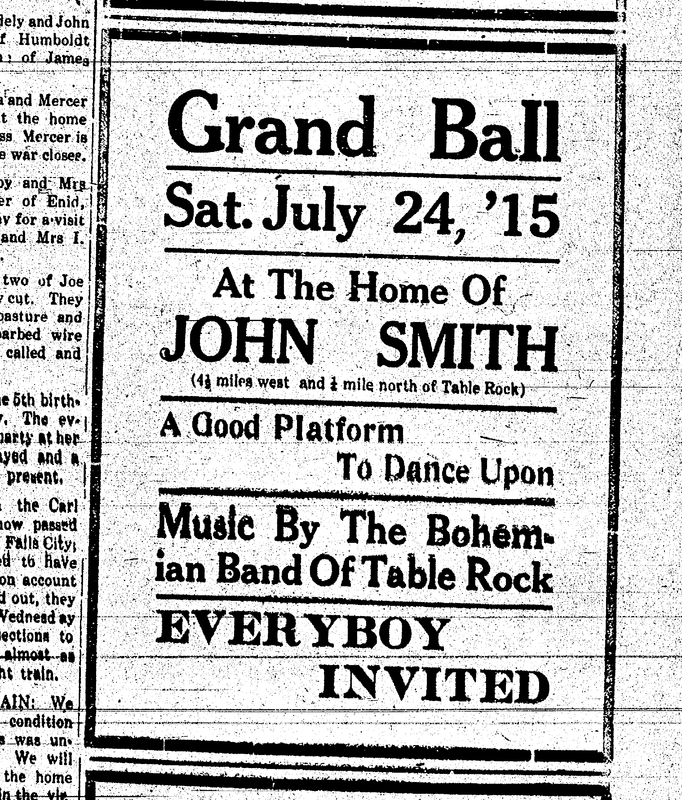 (The other men are not identified.) 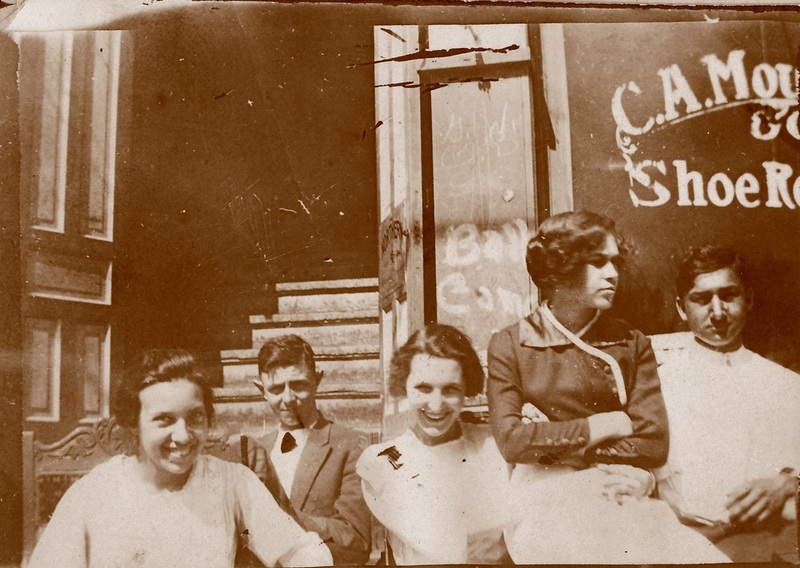 The photo is undated. 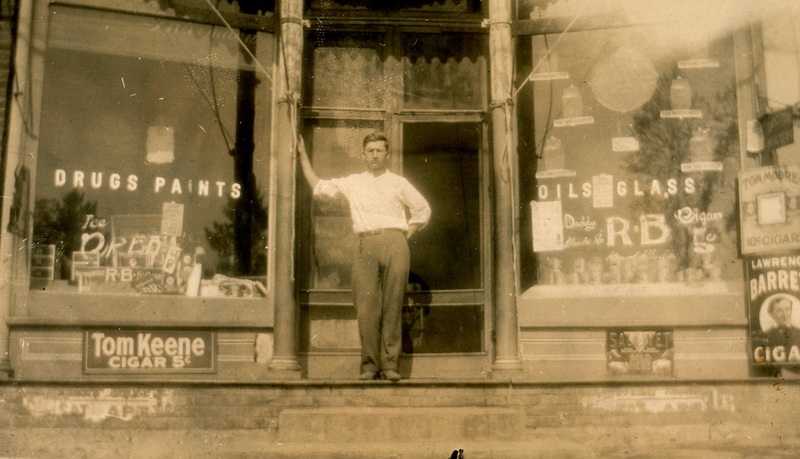 To estimate the photo's age, consider Bill Frank's age in the photo. He was born in 1860. 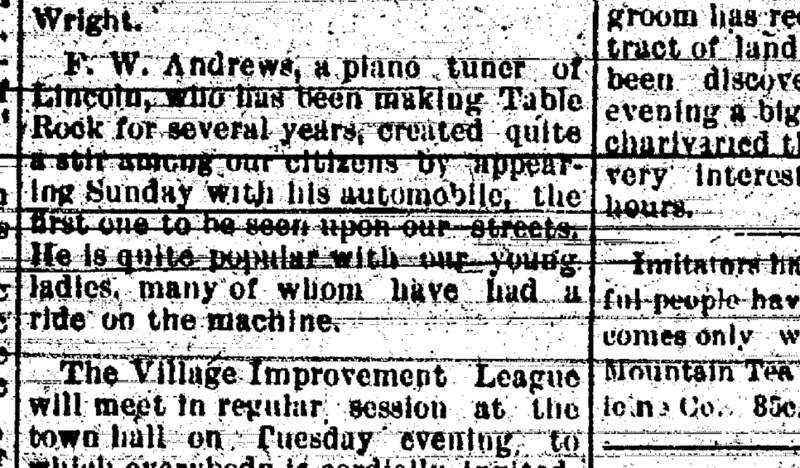 Adam Hayes was also in the news 100 years ago. He bailed hay to make room in his barn. 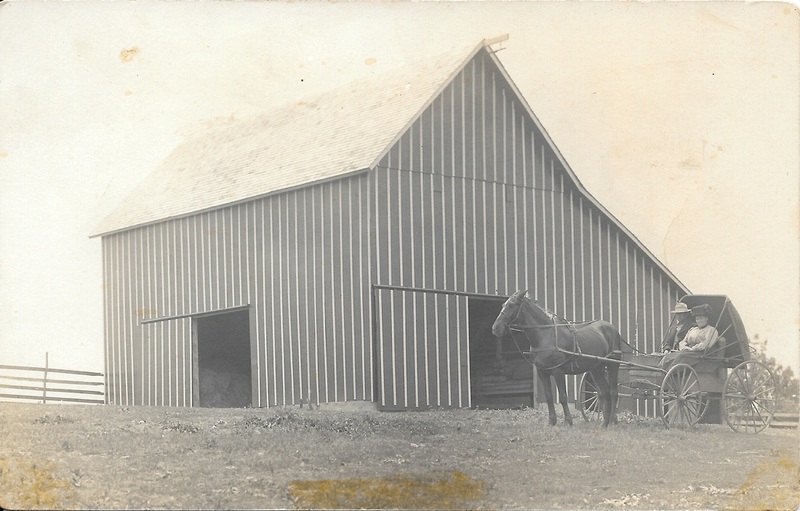 Under te photo of Bill Frank is a photo of Mr. & Mrs. Adam Hayes in front of a fine barn, probably "the" barn. Photo 481 (undated) below the photo of Bill Frank. 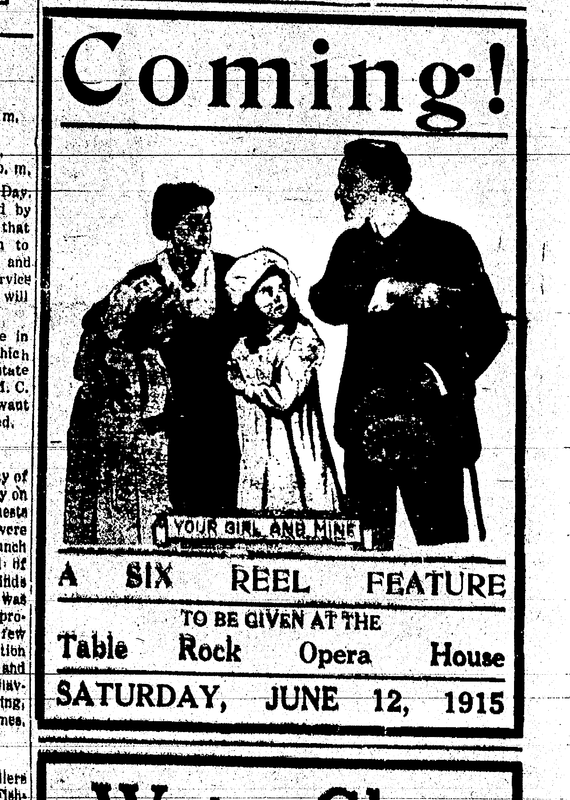 June 1915: A. 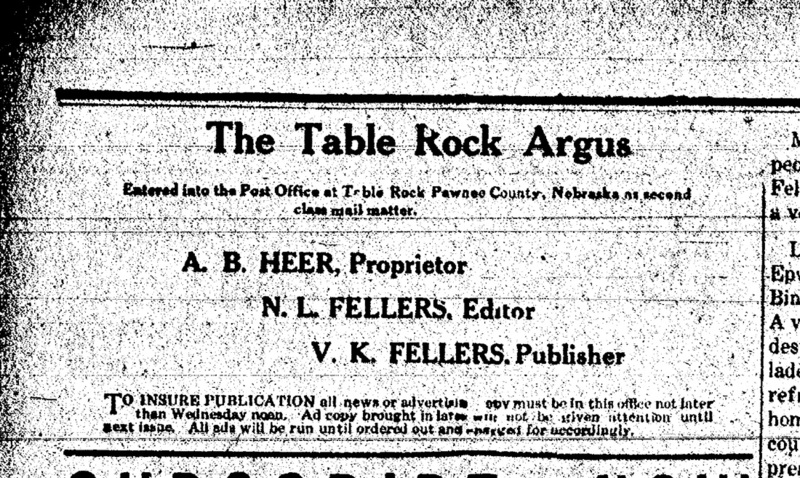 B. Heer, Proprietor; N. L. Fellers, Editor; V.K. 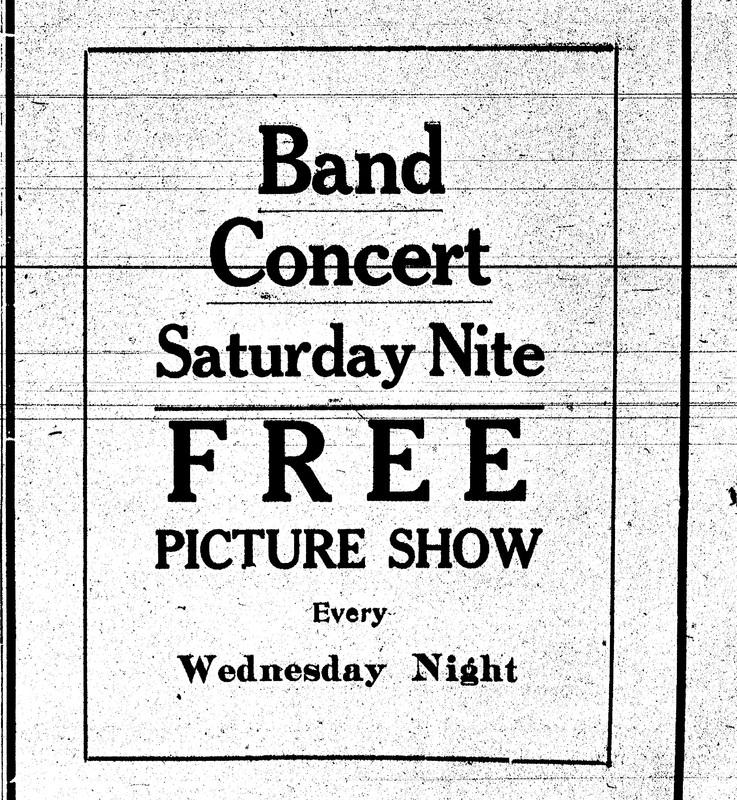 (Vic) Fellers, Publisher. Frank Taylor was editor/publisher before and after. 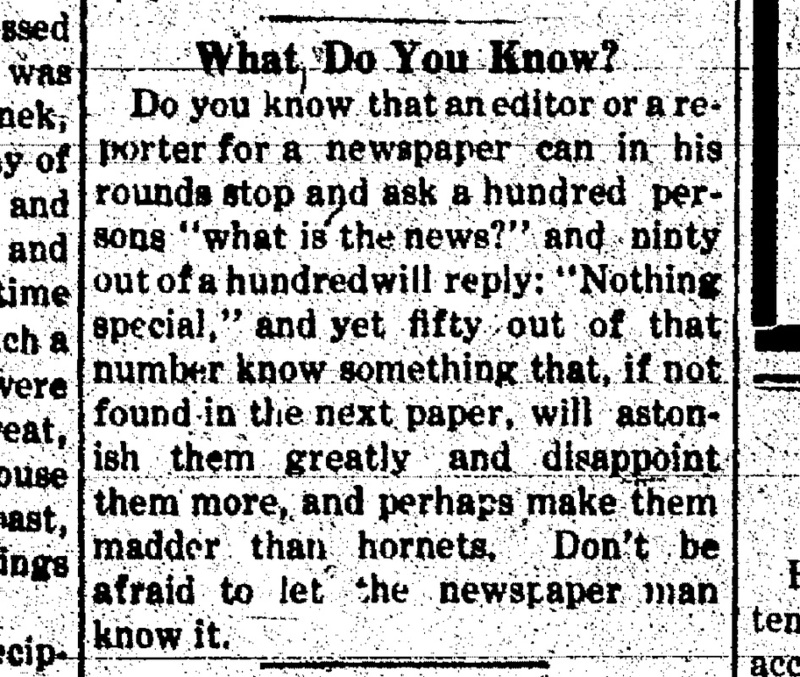 to publish a particular news item about them, it "will astonish them greatly and disappoint them more, and perhaps make them madder than hornets." 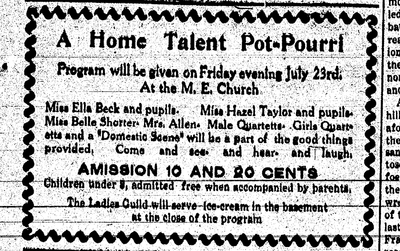 On the program: Hazel Taylor, William Sutton, O. D. Owe, Ella Beck, Captain R. P. Jennings, M.H Marble, C.W. Beck, F.A. Harrison, and Dr. W. H. Wilson. 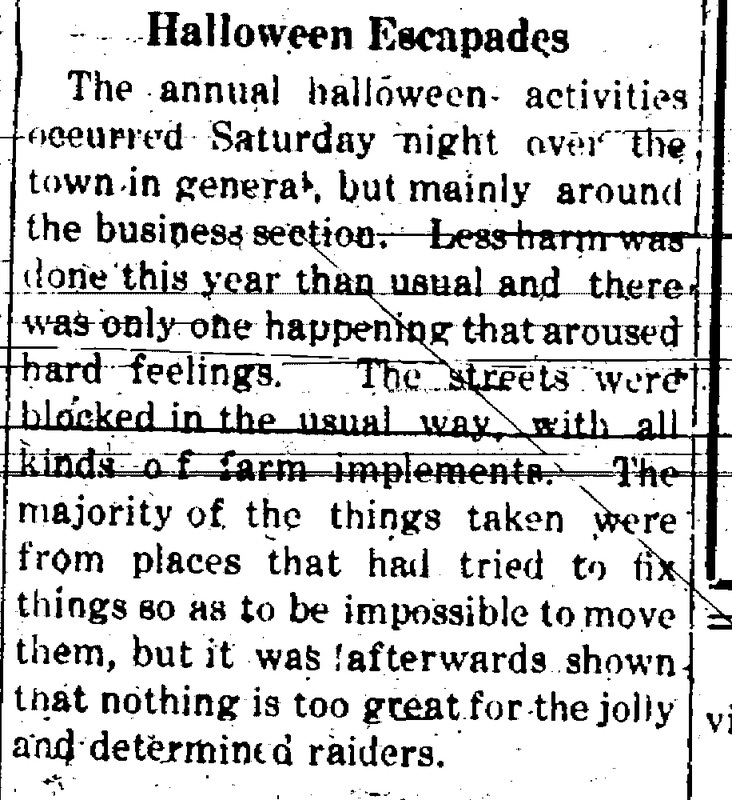 Halloween - only one happening aroused hard feelings. 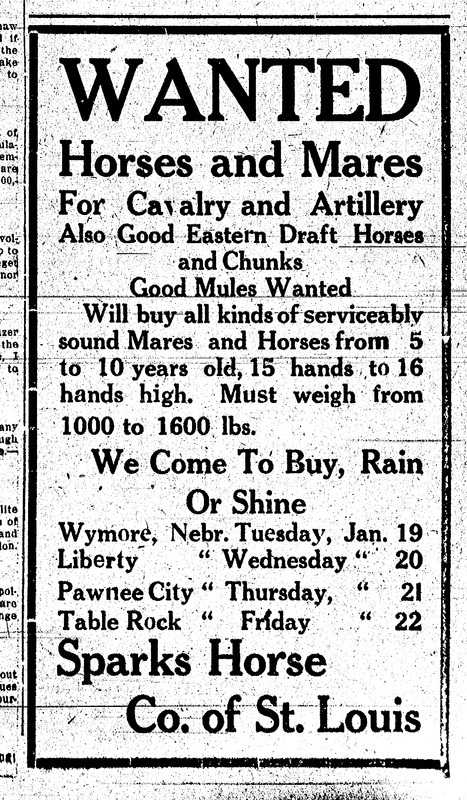 As was common in small Nebraska towns in those days, the streets were blocked with stuffs, here farm implements drug to town by "jolly and determined raiders." 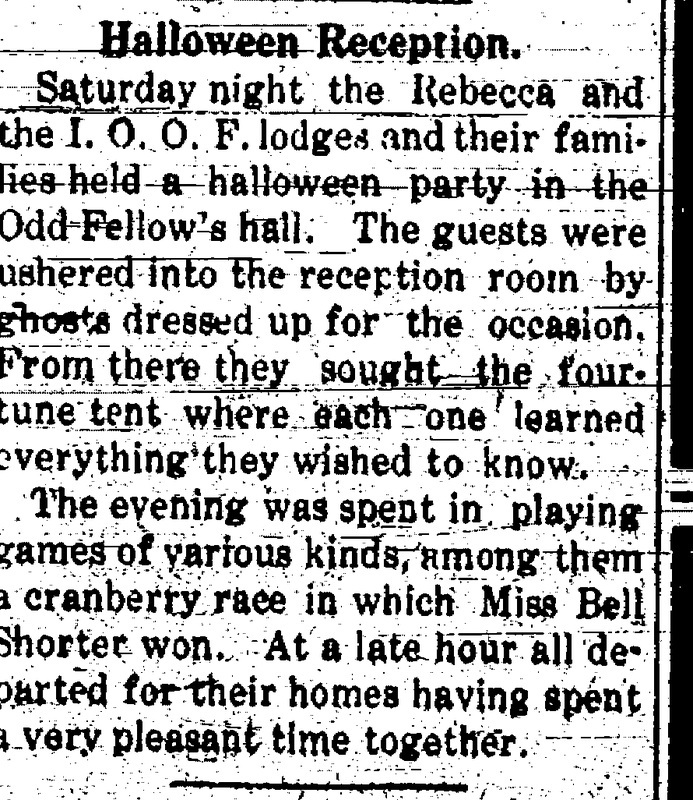 The Odd Fellows and Rebekahs had a party -- ghosts ushered guests into the reception room and the guests could then visit a fortune teller. AND, FAR AWAY, THE WAR IN EUROPE LOOMS.